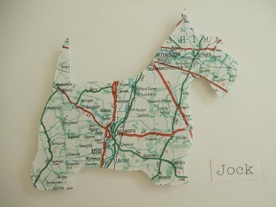 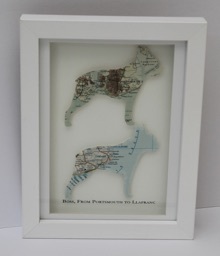 For a totally unique way of having your dog’s portrait done how about a unique piece of ‘Dog Map Art’. 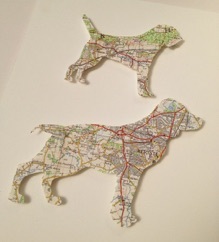 The silhouette of your dog is cut from a map of your choice. 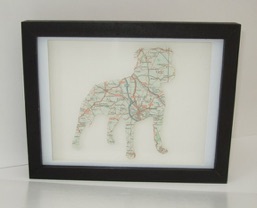 Choose a location that means something to you i.e. 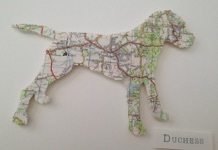 favourite walk, where you live or opt for a map of where the breed originates from. 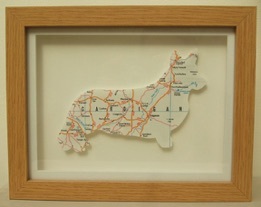 Larger frames are available to include more dogs, please enquire for more size and price information. 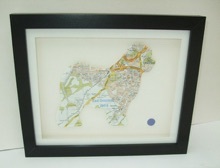 Mounted on high quality cartridge paper and framed in a box frame in either light oak, oak, black or white. 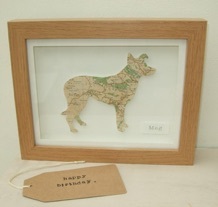 * When ordering you will need to provide a side on, profile photograph of the dog in question or a few photographs which I can work from. 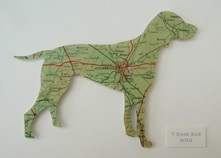 Alternatively a standard silhouette of the breed can be used.